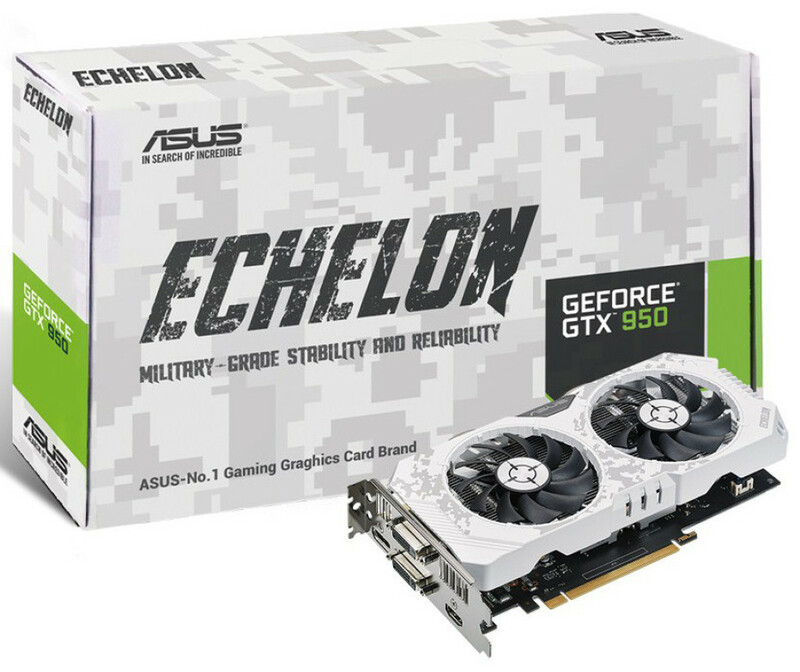 The resurgence of the GeForce GTX 950 has gone one more step further today with ASUS announcing the new Echelon GTX 950 Limited Edition video card. The new ASUS product comes with excellent performance, military-class components and a stunning chassis in an arctic theme but this is not everything – the card is factory-overclocked and offers a 15-day World of Warships trial to all people who purchase it. The card comes with two cooling fans with DirectCU II cooling technology for 20 per cent better cooling performance and 4x longer lifespan compared to reference cards. Under the fans the Echelon GTX 950 features the NVIDIA GM206-250 Maxwell GPU with 768 stream processors and a 128-bit memory bus. The GPU runs at 1165 MHz (1355 MHz Turbo), while the installed 2 GB of GDDR5 memory works at 6612 MHz. The card comes with a 6-pin power connector, which should be used in case you want to further overclock the Echelon GTX 950. The new Asus Echelon-GTX950-O2G video card supports 2-way SLI and offers DVI-D, DVI-I, HDMI 2.0 and DisplayPort 1.2 connectors in the back. The card, which measures 220 x 125 x 39 mm, can be pre-ordered now for EUR 176.